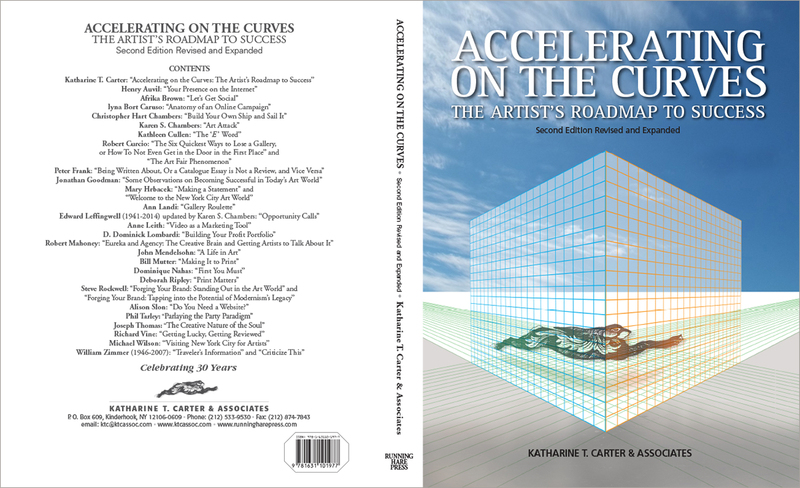 Katharine T. Carter & Associates and Running Hare Press announce the publication of the Second Edition, Revised and Expanded, of Accelerating on the Curves: The Artist’s Roadmap to Success. This definitive guide to self-marketing and career advancement for artists is the culmination of over 30 years experience guiding countless artists toward successful professional outcomes. Please visit www.runningharepress.com for information on Accelerating on the Curves> including numerous endorsements from leading art world professionals and a complete list of media coverage. The book has been reviewed in Art in America, Sculpture Magazine, Ceramic Review, Artist Magazine, Professional Artist, Resolve 40, FAME NY, Chicago Art, dArt International, NY Arts Magazine, WYBC Yale University Press. The 419 page volume is anchored by Katharine T. Carter’s detailed roadmap for building an exhibition record, and advancing from local and regional success to a path toward national recognition. Included are numerous practical guidelines and approaches to marketing and presentation ¬– sample pitch letters, artist statements, press releases and résumés, as well as protocols and advice on the best ways to effectively communicate with professionals in every sector of the art world. Individual chapter contributions by the company’s distinguished Associates cover a broad range of issues and professional development topics. And finally, a comprehensive, up-to-date Information Resources index provides a wealth of useful research tools, publications, contacts and professional services essential to artists. Founded in 1985, Katharine T. Carter & Associates is the only company in the U.S. to offer museum and gallery placement services and comprehensive promotional support to artists, public relations and marketing and educational programming. The prestigious roster of Associates includes leading critics, curators, editors, dealers and marketing professionals. Over the years, the company’s efforts have resulted in over 1,000 one-person exhibitions for artist clients. 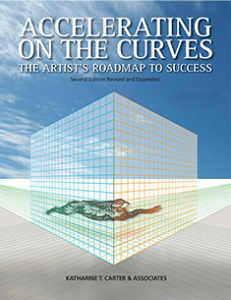 This record of success is the foundation for the approaches and strategies outlined in Accelerating on the Curves.